And this works great. Why can't I use the following? As you can access the column/Series as df.column_name, I expect this to work. It's difficult to make del df.column_name work simply as the result of syntactic limitations in Python. del df[name] gets translated to df.__delitem__(name) under the covers by Python. There is an optional parameter inplace so that the original data can be modified without creating a copy. Why can't I use del df.column_name? At first we need to understand the problem, which requires us to dive into python magic methods. In fact, del should almost never be used because of the precarious circumstances under which it is called; use it with caution! You could argue that del df['column_name'] should not be used or encouraged, and thereby del df.column_name should not even be considered. However, in theory, del df.column_name could be implemeted to work in pandas using the magic method __delattr__. This does however introduce certain problems, problems which the del df['column_name'] implementation already has, but in lesser degree. What if I define a column in a dataframe called "dtypes" or "columns". Then assume I want to delete these columns. del df.dtypes would make the __delattr__ method confused as if it should delete the "dtypes" attribute or the "dtypes" column. Is a dataframe a collection of columns? Is a dataframe a collection of rows? Is a column an attribute of a dataframe? No, but if you want it to be, you can use the .ix, .loc or .iloc methods. Maybe, do you want to read data? Then yes, unless the name of the attribute is already taken by another attribute belonging to the dataframe. Do you want to modify data? Then no. You cannot do del df.column_name because pandas has a quite wildly grown architecture that needs to be reconsidered in order for this kind of cognitive dissonance not to occur to its users. There are multiple ways of deleting a column. Columns are sometimes attributes but sometimes not. Does del df.dtypes delete the dtypes attribute or the dtypes column? This is new from pandas 0.16.1 onward. Documentation is here. 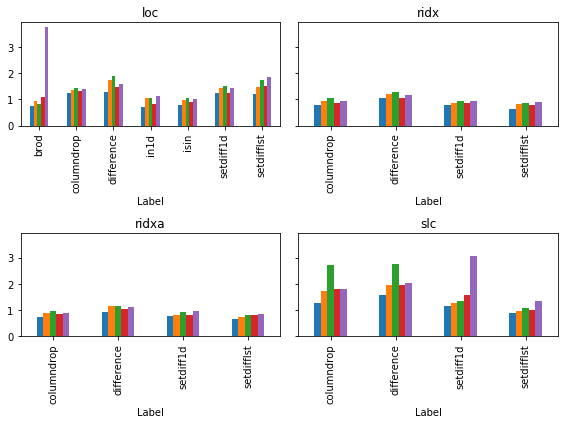 Pandas version 0.21 has changed the drop method slightly to include both the index and columns parameters to match the signature of the rename and reindex methods. Personally, I prefer using the axis parameter to denote columns or index because it is the predominant keyword parameter used in nearly all pandas methods. But, now you have some added choices in version 0.21. Deleting a column is semantically the same as selecting the other columns. I'll show a few additional methods to consider. I'll also focus on the general solution of deleting multiple columns at once and allowing for the attempt to delete columns not present. Using these solutions are general and will work for the simple case as well. We start by manufacturing the list/array of labels that represent the columns we want to keep and without the columns we want to delete. This is relative to the time it takes to run df.drop(dlst, 1, errors='ignore'). It seems like after all that effort, we only improve performance modestly. If fact the best solutions use reindex or reindex_axis on the hack list(set(df.columns.values.tolist()).difference(dlst)). A close second and still very marginally better than drop is np.setdiff1d. How to select all columns, except one column in pandas? How to simplify deletion of multiple columns? How to delete a column from a data frame with pandas?